From the desired Home screen, tap the Apps button. This brings up all the apps you have installed on your phone. Press and hold the App you want to add. Your screen returns to your last Home page with an app-shortcut icon randomly placed on the screen. Now just drag the shortcut to where you want it. Done. If you want to see widgets instead, press and hold the Recent Apps/Menu button from the desired Home screen page as in step 1 above. Press the Widgets button. This takes to you the Widgets screen. Slide your finger across the screen to bring up the different Widgets screens. Press and Hold on the Icon you want. After you see the app or widget you want to appear on your Home screen, press and hold the icon. 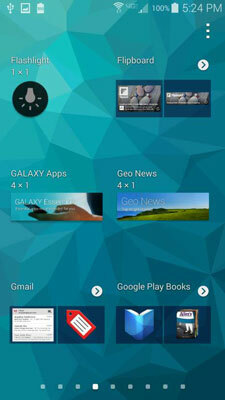 In a few seconds, the app or widget appears on the Home screen you were on most recently. Done. Say that you put the shortcut on the wrong screen. No problem. You can press and hold it, and then drag it left or right until it’s on the screen you want. Taking a shortcut off your Home screen is simple: Press and hold the shortcut on the screen. In a moment, a garbage can icon appears at the top of the screen. Drag the doomed shortcut to the garbage can, and off it goes to its maker. It’s gone, but if you made a mistake, you can get it back easily enough. To re-create it, simply go back to the App Menu key and follow the process again.